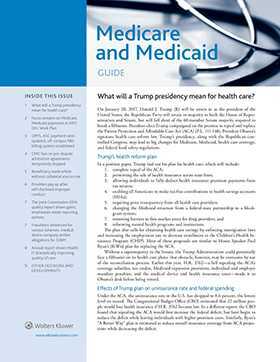 Medicare and Medicaid Guide is the leading resource covering reimbursement for health care services and compliance. Its easy-to-use format provides the primary source information you need, and the expert guidance for using that knowledge to your best advantage. Since its inception in 1969, the Medicare and Medicaid Guide has provided comprehensive reporting of federal Medicare and Medicaid law and regulations, case law, administrative decisions and more, expertly analyzed and explained by Wolters Kluwer editorial staff, providing health care professionals direction on how to apply the knowledge to their respective organization.